Industrial carts deliver flexibility and top quality to complement lean material handling programs. 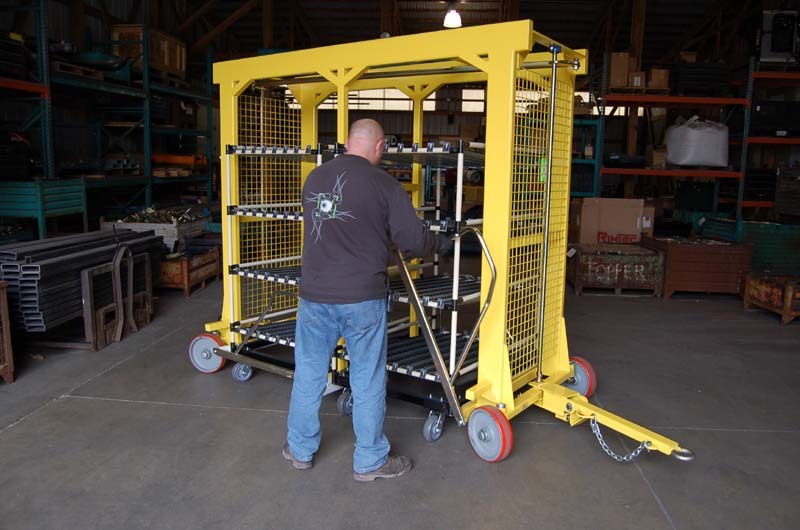 Between loading docks, storage areas, workplaces, and even within the most unyielding assembly lines, customized industrial carts can assist in the delivery of components and parts to assembly line workers line side at the exact point of assembly. The popularity of cart delivery Fork Truck Free (FTF) material handling solutions rests with the ability to improve work flow and shorten production times, eliminate parts collection downtime, free skilled employees for higher-value activities, clear factory floor space, and free up capital. 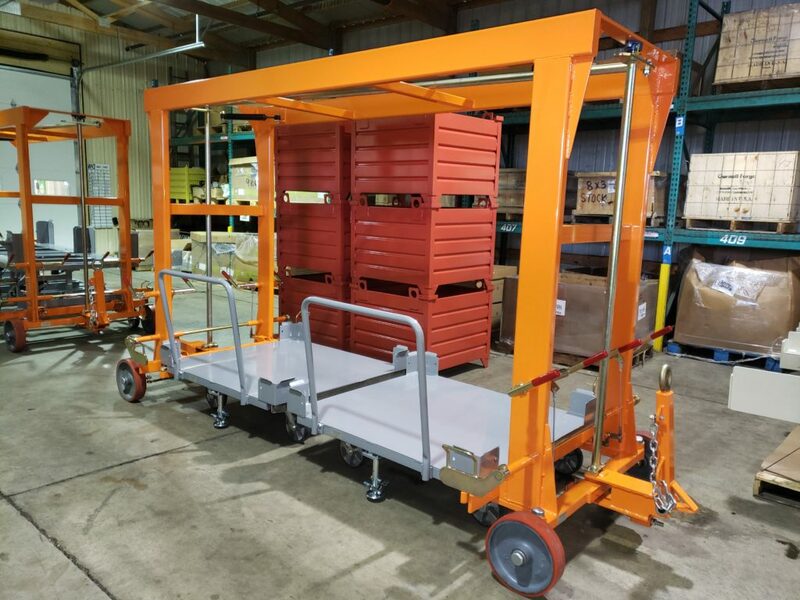 Instead of installing permanent overhead or floor assembly lines, some manufacturers opt for custom carts to transport product through the assembly line—creating a continuous build line. Should production processes need to change, a significantly smaller capital investment is required to make adjustments rather than a permanent material handling installation. Using this cart concept, makes it very easy to pull a part off the line for quality inspection at any point during production. The flexibility in lineside delivery carts may include angled shelves and/or horizontal shelves. Each shelf can be positioned to optimize the interface with the associate. The design of this simple cart makes it easy to see into each box and properly position picked products in the box. Since these carts are pulled all day every day, ergonomics is key, it is important to keep the weight as flexible as possible while maintaining the necessary strength and durability. Because daughter carts come in a wide variety of configurations, this delivery cart is very flexible. A Mother Daughter Cart (Also called Nesting Cart System) is an industrial cart system consisting of one large mother cart and two or more, smaller daughter carts. The daughter carts are designed to fit within the mother cart’s framework. Once inside, the daughter carts are locked into the mother cart. The mother cart and daughter carts are then able to be tugged as one. Daughter Carts can be and are often different types of carts. For instance, One Mother Cart can be designed to carry a static cart as a daughter cart and a rotation cart as a daughter cart. The Mother Daughter Cart System is a very flexible, effective cart system. Mother-Daughter Cart Deliver System by Topper Industrial can pull a variety of different daughter cart types. Engineered with a diamond pattern for flexibility, the large mother cart frame can accommodate multiple, different daughter carts—including a static cart, a tilt cart, a rotation cart, a kit cart, or a tube and joint cart and more with different caster arrangements. When locked together, the carts are tugged as one unit, supporting unlimited line side manufacturing deliveries and applications without forklifts. At the assembly line, the operator swaps out a full daughter cart for an empty one and can work directly out of the carts.